b. 14 September 1982, Horsham, Vic. d. 27 June 2004, Henty Highway, Vic. 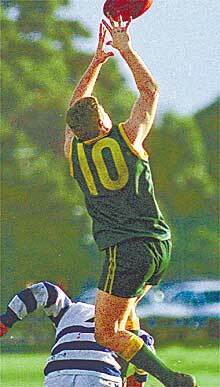 Several hundred mourners overflowed the spacious modern St. Peter's Lutheran Church on the outskirts of the famous small Western Highway town of Dimboola on 8 July 2004 to say their goodbyes to Ricci Marks, an exceptional young man cruelly taken from his family and friends. Despite the overwhelming sadness of the occasion, Ricci Mark's funeral also represented a coming together in strength of a larger community in western Victoria, very unlike the much smaller gathering which buried Ricci Vicenti at Karrakatta Cemetery in much more public circumstances in Western Australia on 5 April 1982, 22 years earlier. Ricci Vicenti had become one of the "black deaths in custody", fatally shot by a prison warder, without ever knowing that his second son had been conceived. That second son, Ricci Marks, died in a single vehicle crash when he apparently lost control of his car in the early hours of Sunday morning headed home to Halls Gap and his family. Fatigue was likely a factor. Unlike Ricci Vicenti at 19, Ricci Marks at 21 had a life which was going somewhere. He had become a tower of strength to his family. Since leaving school, Ricci Marks worked as a cultural officer for the Brambuk Aboriginal Cultural Centre at Halls Gap. He was also a highly regarded local footballer and current player with the Heywood Football Club. In 2002, Ricci Marks was recognised with an Aboriginal Young Achiever award, an award which the Victorian state government moved quickly to rename in his honour. Ricci Marks's funeral, his burial at icy Dimboola cemetery and the gathering for refreshments afterwards at a local hall were attended by a wide representation of both Aboriginal and white communities with even less sign of any boundary between those communities than young Ricci would have encountered in his own wanderings between them. Australian Rules Football provides an ever stronger bridge between the communities. The funeral gained a human face through the words of his mother, his 9 year old youngest brother and several other family members, friends and representative officials. At the burial, the haunting sounds of a didgeridoo said more than words ever could. Some of those Ricci Marks had met through football travelled from as far as Perth for the funeral. Amongst the prominent Australians who attended without special recognition were reigning Brownlow Medalist Adam Goodes and ATSIC chairman Geoff Clarke. Maybe a hundred mourners travelled from the predominantly white Heywood Football Club, while other contingents represented other clubs where Ricci had played over the years, and Aboriginal community groups. I was the only person to attend the funerals of both Riccis, father and son, having travelled from Melbourne to in a sense represent Ricci Vicenti's white foster family as well as his aboriginal family in Perth, the two families having become even closer over the years since Ricci Vicenti's death. Ricci Vicenti's first son, Ricci Marks's older brother, Tony, was named after me. On the four hour drive up the Western Highway to Dimboola I could not help but notice at least three of the increasingly visible roadside memorials, all adorned with fresh floral tributes, marking the sites of other road deaths. When I was young, our family lost an uncle on the same highway. And I was reminded of other deaths that were both before their time and out of the blue, deaths which robbed family and friends of youngsters with as much demonstrated ability and potential as Ricci Marks, but never truly of somebody so needed. Yet there was something too at the funeral that said that the community will be strong. This is one more hurdle, one more sadness, but progress, as slow as it sometimes seems, will continue. Over the years since Ricci Vicenti's death, our family have managed to keep up irregular contact with the older Ricci's then defacto, Annita Marks, the mother of the younger Ricci and Tony, sometimes when I could get my act together while travelling through Horsham or Dimboola en route to or from Adelaide, a route I have come to avoid almost as often as I have continued to use it. The most memorable of those visits was on 13 January 1992 on our way back from a once-off Under 12 cricket trip to Adelaide. I took the Dimboola exit to try to catch up with Annita, but found only the boys there and they having a hit in the street with some neighbouring boys. Past half way of our long drive, my Tarago load of boys were keen to stretch their legs and before I could blink had organised a street cricket match with the locals while I waited for Annita's return. Ricci Vicenti, Annita and baby Tony had been in Perth for many months in 1981-82 during which I had been out of the loop before getting the shock news that Ricci had been shot in the head while attempting to escape from Canning Vale Remand Centre the day before he was due to be sentenced for a minor property offence. All the details were in the Western Australian papers, were amplified at the coronial inquiry and again at the Black Deaths in Custody Royal Commission, so don't bear repeating here. Ricci Vicenti was in intensive care at Perth Hospital and not expected to live, so my mother, who had fostered him, and I booked a flight to Perth, but only after I conceded that I should not waste my ticket to Elton John's concert at Melbourne's Festival Hall, a concert at which Moving Pictures were a support act and I heard What About Me? for the first time. We met Ricci's mother, Heather, and elder brother, Kim, at the hospital, seemingly releasing Ricci to die an hour after our arrival. I had avoided every excuse to go to Perth previously, but became real friends with Heather and Kim in particular, and have managed to keep in touch with them since, in recent years more often through Heather visiting my mother in Melbourne than through me getting back to Perth. One bemusing sidelight was dealing with the Perth bureaucracy who seemed to find it easier to do whatever this aggrieved eastern stater told them they should do than to think for themselves, most importantly agreeing to pay for a regular funeral. The funeral itself was attended by a handful of others who had joined us from the other side of the country, Heather's family and friends, a few then Perth-based white friends, a few aboriginal activists and the media. I was more than happy to drive to the funeral with Dylan's Blowing in the Wind playing loudly on the rental car cassette deck and the windows down. An all too short generation later, such things were unnecessary to the point of being unthinkable as almost ten times as many mourners, sans visible media, congregated for Ricci Marks. While the circumstances of Ricci Vicenti's death were widely reported and analysed and his life was arguably going nowhere in the months before his death, he had already squeezed a very full life into his 19 years. A short film, A Little Life, told a fraction of that story, drawing in particular on a home movie he himself had made, the final scene of which had him acting as a robber and being shot by police. My mother and I have kept a substantial collection of Ricci's art and other memorabilia which it is time we worked out what to do with. There was no such grand closure to the similarly short life of Ricci Marks, though he was certainly starting to make his mark on the world, a 16 February 2004 report of his cultural work in The Age having been picked up by several other interested web sites around the world. There are signs that young Ricci inspired his wider community sufficiently that they will not just continue his work but maybe do more in his memory than might have been done in other circumstances. But for his immediate family it will not be so easy. The gap that his untimely death leaves in their lives can never really be filled. Junior cricket took me back through Dimboola on a very hot December day in 1994 and to a chance to be enchanted by the chatter of Little Corellas roosting in the River Red Gums beside the Rowing Club. Arriving in town way too early before Ricci Marks's funeral, I again found my way to that spot beside the Wimmera River. On a chilly winter's morning some Little Corellas were there again.